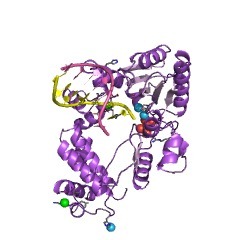 Polbase - Reference: A structural basis for metal ion mutagenicity and nucleotide selectivity in human DNA polymerase beta. 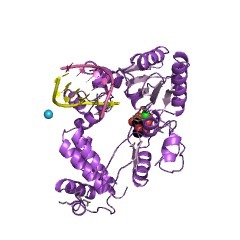 A structural basis for metal ion mutagenicity and nucleotide selectivity in human DNA polymerase beta. When crystals of human DNA polymerase beta (pol beta) complexed with DNA [Pelletier, H., Sawaya, M. R., Wolfle, W., Wilson, S. H., & Kraut, J. 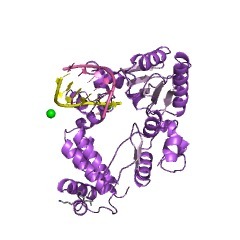 (1996) Biochemistry 35, 12742-12761] are soaked in the presence of dATP and Mn2+, X-ray structural analysis shows that nucleotidyl transfer to the primer 3'-OH takes place directly in the crystals, even though the DNA is blunt-ended at the active site. Under similar crystal-soaking conditions, there is no evidence for a reaction when Mn2+ is replaced by Mg2+, which is thought to be the divalent metal ion utilized by most polymerases in vivo. These results suggest that one way Mn2+ may manifest its mutagenic effect on polymerases is by promoting greater reactivity than Mg2+ at the catalytic site, thereby allowing the nucleotidyl transfer reaction to take place with little or no regard to instructions from a template. 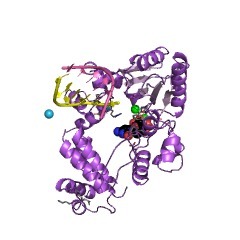 Non-template-directed nucleotidyl transfer is also observed when pol beta-DNA cocrystals are soaked in the presence of dATP and Zn2+, but the reaction products differ in that the sugar moiety of the incorporated nucleotide appears distorted or otherwise cleaved, in agreement with reports that Zn2+ may act as a polymerase inhibitor rather than as a mutagen [Sirover, M. A., & Loeb, L. A. (1976) Science 194, 1434-1436]. Although no reaction is observed when crystals are soaked in the presence of dATP and other metal ions such as Ca2+, Co2+, Cr3+, or Ni2+, X-ray structural analyses show that these metal ions coordinate the triphosphate moiety of the nucleotide in a manner that differs from that observed with Mg2+. In addition, all metal ions tested, with the exception of Mg2+, promote a change in the side-chain position of aspartic acid 192, which is one of three highly conserved active-site carboxylate residues. Soaking experiments with nucleotides other than dATP (namely, dCTP, dGTP, dTTP, ATP, ddATP, ddCTP, AZT-TP, and dATP alpha S) reveal a non-base-specific binding site on pol beta for the triphosphate and sugar moieties of a nucleotide, suggesting a possible mechanism for nucleotide selectivity whereby triphosphate-sugar binding precedes a check for correct base pairing with the template.